According to recent reports, two of the world’s leading vaccine manufacturers, Sanofi Pasteur and Merck, have joined forces to produce the new wonder vaccine, Vaxelis. Their vaccine is being advertised as a hexavalent vaccination, or a 6-in-1 vaccine, aimed at protecting children aged six weeks to four years of age against diphtheria, tetanus, pertussis, poliomyelitis, hepatitis B and invasive disease due to haemophilus influenzae type B. “Do not administer VAXELIS to anyone with a history of encephalopathy (e.g., coma, decreased level of consciousness, prolonged seizures), within 7 days of a pertussis-containing vaccine, that is not attributable to another identifiable cause. This advice is all very good, but how do parents know whether or not their child has had an allergic reaction to any of these ingredients, particularly when the pharmaceutical industry and the medical profession very rarely admit that a vaccine is the cause for their child’s injury? This vaccination is recommended for children as young as six weeks of age. Consequently, this vaccination could be the first vaccination that a child has received and, therefore, how could anyone know whether or not the child is allergic to any of the ingredients? For those of you who are unaware, the definition of apnea is a ‘temporary cessation of breathing.’ In other words, Sanofi admit that this vaccination can be life-threatening, especially in premature babies. Interestingly, whilst Sanofi appeared to be extremely open and honest throughout their press release, they failed to mention what we believe to be an extremely important fact. According to the vaccine product information leaflet, six babies who participated in the two US studies died after receiving the vaccination. 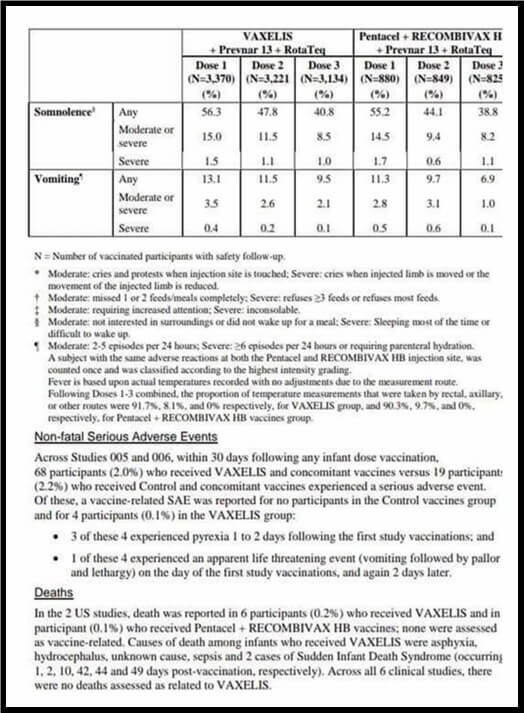 As death following a vaccination is rarely ever acknowledged to be associated with the vaccine itself, we believe that their last sentence stating that ‘across all six clinical studies, there were no deaths assessed as related to Vaxelis’ is irrelevant. The manufacturer did not offer any evidence to support that the vaccine did not cause the death of these children. Furthermore, the only fact that we could find, was the fact that all of the babies who died, died within days of receiving this vaccination. Whilst Sanofi denied that Vaxelis could be responsible for the death of these babies, others are less convinced that vaccinations cannot lead to the death of an infant. Research supports the fact that a growing number of parents and professionals around the world are beginning to acknowledge that vaccinations can lead to death of some children. The above video is just one example of a growing number of parents who remain convinced that vaccinations led to the death of their babies. However, it is not just the parents who are connecting the dots. In fact, a growing number of professionals have been connecting the dots for many years. Dr. Scheibner explained that this important feature was the difference between life and death, and that during a stress response, the breathing stops first, while the heart is still beating. She explained that it is important to be alerted by an alarm, before the heart stops, in order to resuscitate the baby. When Scheibner and Karlsson studied the histograms (printed data), they noticed that whenever the infants received a vaccination, the charts showed clusters of stress-induced breathing patterns, proving conclusively that the vaccines had caused the infants to suffer breathing problems. Her paper is well worth reading, as we believe that it proves categorically that vaccines can and do cause babies to die. Taking Miller’s figures into account, we believe that vaccinating a six-week-old infant with a 6-in-1 vaccination that has already led to the possible deaths of six infants during clinical trials is asking for trouble. 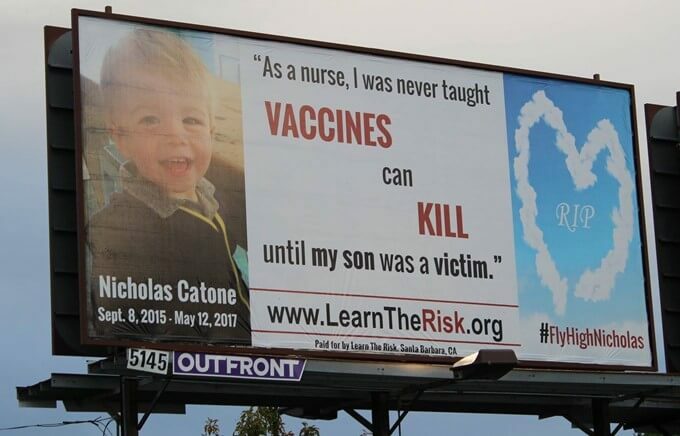 We will leave you with the photo of a billboard that was recently erected in Missouri, after a former MMA fighter’s son died after he received the DTaP vaccination.